We found a few recipes for Lychee Liqueur and the China Blue jumped off the page and begged us to try it. 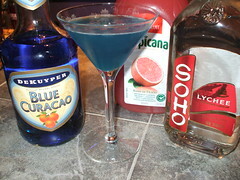 Sometimes its just fun to make a blue drink. Shake in a shaker with ice and serve in a cocktail glass. Keep in mind my loyal drunks, that Curacao tastes the same no matter what color it is. If you dont have blue you could make this sucker any color you want. Green, red, orange etc... its the bitter orange flavor your after. As for the grapefruit juice, there seems to be a shortage of plain grapefruit juice. Usually all I can find is ruby red, the more sweet version of grapefruit juice and the more popular. I believe the grapefruit juice style will change the overall flavor of the drink and look forward to trying regular when I find it. The drink was lovely with a great tropical exotic feel. A bit sweet for my tastes, I'm a sour guy, and I dont think I could drink more than one, but the wife like it and tried a second. We halfed toned down the Curacao to 1/2 oz. and added 1/2 oz. of water. This didnt effect the overall taste, and cut a few calories to boot. i currently live in japan and had my first blue china a couple of months ago and it quickly became a favorite. even out here though, it's uncommon to find someone who makes it. awesome drink though!